Today I am sharing one of my favorite Handmade Christmas card from the Embellished Ornaments stamp set. But before I forget, a quick reminder that tomorrow, Monday November 23rd is the start of Stampin’ Up!’s Holiday Extravaganza Sale! This sale runs from the 23rd to the 30th and has many great Stampin’ Up! products at a discount! 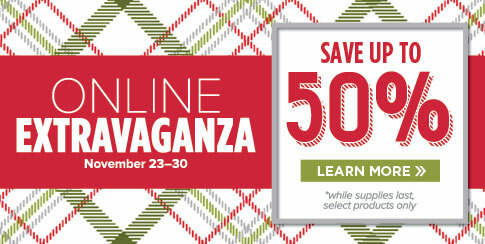 Time to get your Holiday shopping done for your favorite Crafter!! Onto my card share for today!! Today I am sharing a Handmade Holiday card made with the Embellished Ornaments stamp set and Home for Christmas Designer series paper by Stampin’ Up! This is one of the cards that I designed for my Design Team projects for November. I love being part of the Stamping New England Design Team! Each month, 6 of us design 3 projects made with the same stamp sets and Designer paper. These are the projects that I use each month for my Stamper’s Club classes. My Stamper’s Club is open to anyone in the United States since I can only sell Stampin’ Up! product in the US. Check out more information HERE. But even if you aren’t in the US – you can still purchase my tutorials each month that I use for the class projects. You can see those HERE. The card base is an 8 1/2″ x 11″ piece of Very Vanilla Cardstock scored and folded at 4 1/4″. I layered a piece of the Music DSP from the Home for Christmas DSP on a piece of Real Red cardstock. I then cut this at an angle. On the edge of the angle is a small strip of the red diagonal stripped DSP. 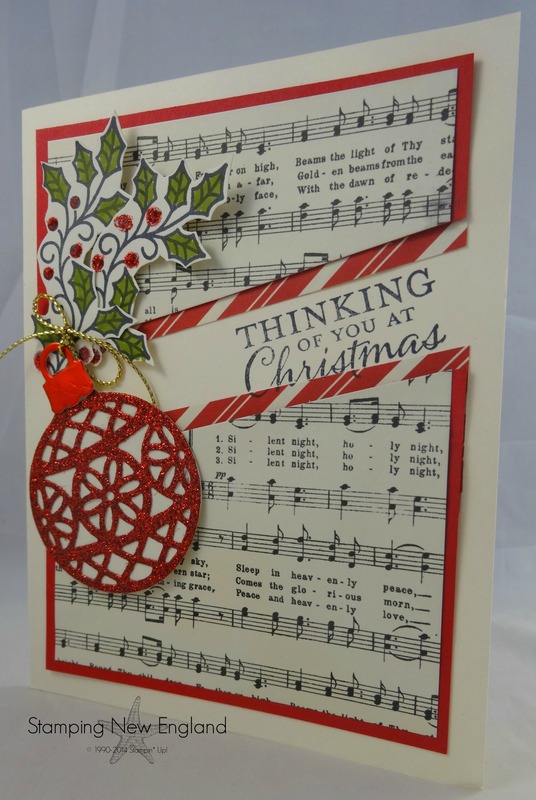 These are layered onto the card with the message “Thinking of you at Christmas” stamped with Black Momento Ink on the diagonal. Next the Holly Branches are stamped with Black Momento ink and cut out with snips. I colored the leaves with Always Artichoke ink and the berries with Real Red ink. I added a dab of Red Dazzling Details to the berries to make them pop! Next I used the Big Shot and Embellished Ornaments framelits to cut an ornament from a piece of Red Glimmer Paper. I cut an ornament topper out of red foil and attached to the ornament. A piece of Gold Cording finishes off the ornament.